The benefits of employee volunteering are well documented. This video showcases some of the highlights. If you're convinced but don't know how to get started, check out the collection of resources below. What is an Employee Volunteer Program? Why are Employee Volunteer Programs Important? 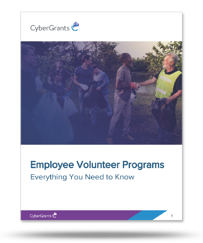 Employee volunteer programs can also be called workplace volunteer programs, corporate volunteer programs, company volunteer programs, and other iterations. These programs are typically built to support a company’s larger corporate social responsibility program or community engagement program. Companies may have specific reasoning for building employee volunteer programs like building a positive brand reputation or increasing employee engagement. Corporate volunteer programs have been shown to reduce employee turnover by as much as 50% and increase productivity by at least 13%. 61% of Millennials want to work for a company that offers volunteering opportunities. 86% of employees would consider leaving their current job to work for one with an excellent corporate reputation. Expand on these steps with more insight and tips in our article, 10 Steps for Starting an Employee Volunteer Program. Define your focus to align with employee and company values. Tailor the program to fit your company’s specific and unique needs. Create achievable and granular goals to ensure you can both reach and measure them. Put together a pitch to get leadership buy-in and budget access. Get support from company leadership to kick off employee participation. Create a meaningful experience by surveying employees on their expectations and needs. Communicate to employees via email, meetings, social media and company intranet. Integrate volunteerism into your culture. Set quarterly milestones to adjust, tweak, check measurements and connect with stakeholders. The evidence is overwhelming that employees want to give when given the opportunity. So create opportunities for them. From skills development pro bono programs to teamwork focused outings, there can be programs for everyone to participate in, no matter their fitness or skill level. People can’t join if they don’t know about your program. While email alerts, SMS text or internal groups as well as traditional means like flyers and company meetings are great to spread the word, there’s nothing like a complete organization management system to coordinate your employees’ philanthropic goals. Sometimes dates and times don’t work out for everyone else or people would rather give monetary gifts. Give them options to contribute even if they can’t be physically there or find the time in their schedule to volunteer. Today’s workforce needs options that are available on the go. If your program is hidden behind an impenetrable firewall or buried in the company intranet, it may be extremely hard to gain company-wide traction. Offer opportunities that employees can access anytime, anywhere. Corporate volunteering benefits employees and employers in so many ways! In fact, studies show that employee volunteering contributes to a happier, healthier and more engaged workforce. Take a look at this complimentary bonus download to see the 10 Most Powerful Benefits to Employee Volunteering. 67% of managers were more likely to volunteer if their co-workers participated. 77% of managers are more likely to volunteer if they are able to use their specific skill set. 77% of the millennial workforce would prefer to volunteer with their coworkers. #1 - Incentivize Volunteers with Gift Cards - Learn what you shouldn’t forget to do if you choose this option! #2 - Treat Employees Volunteers to Lunch - No chains, please! Opt for a locally-owned restaurant to support your local community. Get the rest of the ideas here! From offering employees paid time off to volunteer or hosting company-wide volunteer events, there’s so much you can do to create a volunteer incentive program. No matter the size of your organization, you can increase employee participation in volunteering by providing incentives. We can learn a thing or two about volunteer incentive programs from companies like Novo Nordisk, PCL Construction, and Cadence. In fact, take a look at this article to get ideas for your very own volunteer incentive program! Novo Nordisk’s (@novonordisk) “Changing Our Communities” program is genius. It was launched in 2015 to track and help employees find volunteer opportunities. Employees may submit projects they want to work on, and Novo Nordisk will make a monetary donation to the organization in honor of the employee or department. Make this work for your company: Can’t afford to donate to every organization your employees submit? Here’s a budget-friendly solution; host a company-wide contest that invites anyone to submit ideas for a company-wide volunteer day! Set a monetary amount for project submissions like $5 or $10 or more if you want (depending on the size of your company). Then, take all submissions and stack them against each other to get all of your employees to vote for the best one. Get more volunteer incentive program ideas! So what do you think? We’re going to keep adding to this page until we’ve compiled the largest collection of employee volunteer program content out there! What do you want to see added?